This is the first compilation of guitar music for a right hand technique that includes the little finger. 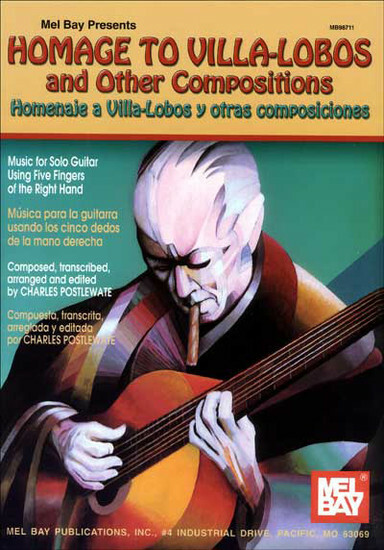 The 12 complete compositions include original pieces by Charles Postlewate (Homage to Villa-Lobos, Variations on a Theme of Prokofiev and Improvisation on Green Dolphin Street), transcriptions of piano pieces by Claude Debussy (La puerta del vino and Dr. Gradus ad Parnassum), arrangements of Peruvian popular songs (Jose Maria and Virgins of the Sun) and new editions of standard repertoire pieces - two studies by Fernando Sor and the beautiful tremolo study by Agustin Barrios, An Alm for the Love of God. Postlewate also includes excerpts of two other standard repertoire pieces by Federico Moreno Torroba (Sonatina) and Heitor Villa-Lobos (Prelude #2) - which are published elsewhere under copyright restrictions - to show the advantage of using the little finger. These pieces demonstrate new right hand techniques for the classical guitar that use the little finger in the playing of scales, chords, arpeggios, tremolos and harmonics. They also show the advantage of using the little finger for speed, accuracy, strength and balance. This book is a companion to MB 98710 - RIGHT HAND STUDIES FOR FIVE FINGERS using Chords, Arpeggios, Tremolos and Harmonics , also by Charles Postlewate.